Still thinking where to bring your kids this summer? Metro Manila residents don’t need to look further. The Mind Museum, which is located at Bonifacio Global City is now offering a number of Summer Programs that your children might be interested in! CSI 101 – Do you want to know how it is like to be a detective? On April 5-7, The Mind Museum will entertain teenagers ages 14-17 as they conduct a three-day forensic science workshop! SURVIVAL SCIENCE – Ever wondered how you can survive in a jungle? 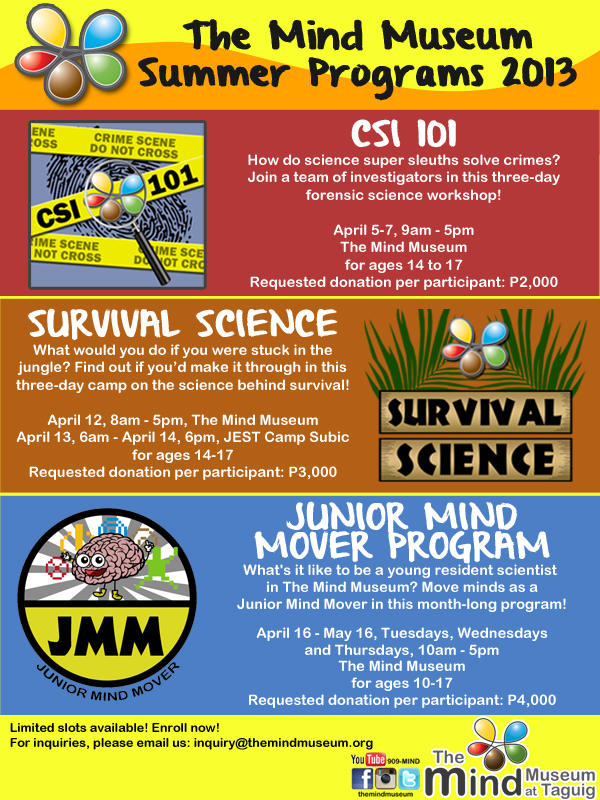 Learn some practical tips and tricks through The Mind Museum and JEST Camp Subic from April 12-14, 2013. JUNIOR MIND MOVER PROGRAM: Kids and teens, get the chance to be one of The Mind Museum’s resident scientist for a month! This program is open for ages 10-17 years old. Spend the month learning the fun way! LIMITED SLOTS ONLY! Email inquiry@themindmuseum.org for inquiries and reservations.